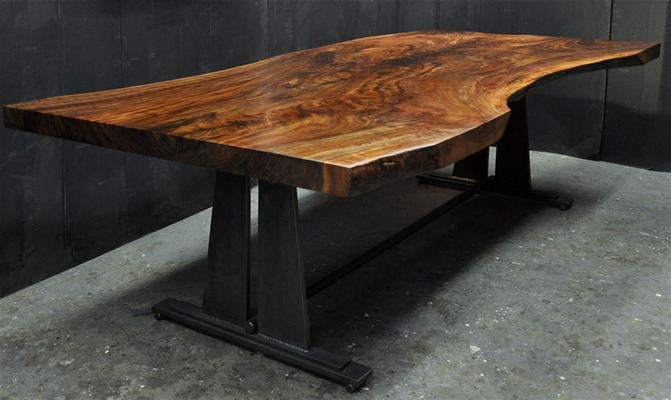 a recent live edge table with a 'nakashimna style' steel base. we have used two other slabs from this log, and it was a particularly exciting one. we used one of the others ofr a headboard and the other for a dining table back in april of 2014. the base for the table shown here was fabricated by sam in our metal shop, and is based on a lighter one he made for one of our first slab desks we made in 2009. the blog post for this table is dated november 21, 2014. many more photos there.